It’s been a busy week of preparation for my first market night, and one thing people have started to ask about is my hard-working spinning wheel. My wheel is the Ashford Joy. When I first looked at wheels back in 2012 I had some very specific needs. Firstly, I needed my wheel to be small, ideally it would be something I could fold up and put away each evening. The houses and flats we’ve shared as a family have been pretty small, and much as I’d love my own workspace, it’s just not possible for the forseeable future. So I work in our living space and need equipment that can be quickly and easily put away. Secondly, due to the residential training I am undertaking, I travel a lot. I like the option of taking my wheel as not only do I always take at least one (usually more!) fibre project to my training weekends, but the type of training I do involves studying one’s everyday activities, and bringing more practical intelligence into the way one carries out these activities. 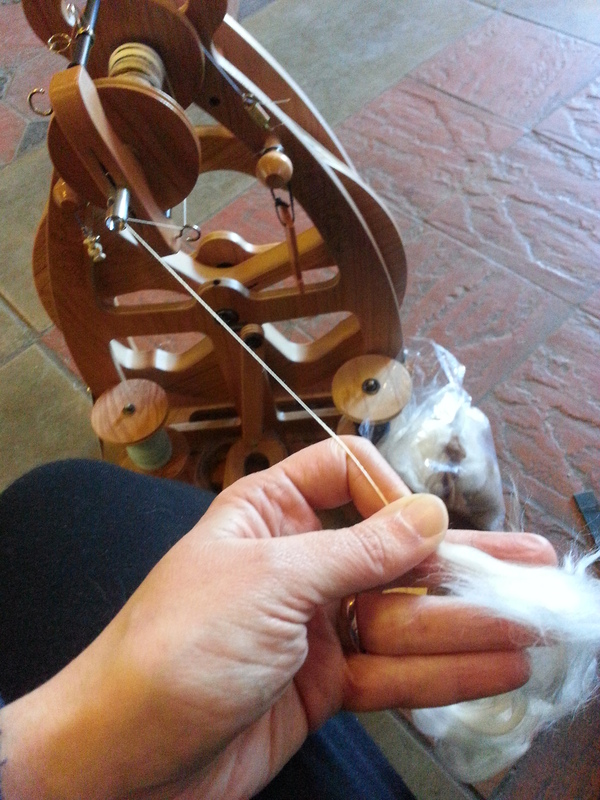 Given that I spend a lot of time engaged in fibre-related crafts, it makes sense to study my movements during these activities and put into practice the training that will help me to perform in the most mechanically economical way. So, a light and easily transportable wheel would be ideal. The Joy ticks all those boxes and more. Starting from the bottom, the Joy comes with the option of either single or double treadle, which seems to depend upon the spinner’s personal preference. The treadle system and the base of the wheel are hinged, fold easily when desired, and can be locked in place in either the folded or unfolded configuration. The built-in drive wheel and whorl system offer four different spinning ratios* – 6:1, 8:1, 11:1 and 14:1, which are easily selected by placing the stretchy drive band in the appropriate grooves around the circumference of drive wheel and whorl. The Joy comes with the standard sliding-hook flyer and 3 bobbins. As an extra it is possible to purchase the jumbo flyer and bobbin for spinning super bulky art yarns. The bobbin is tensioned using a simple scotch tension system which is easily adjusted. There is a built-in orifice hook and built-in holders for two bobbins which, at a pinch, can be used as a lazy kate. Finally, the portability is further enhanced by the built-in carry handle at the top of the wheel, and by the optional carry bag which keeps the Joy protected, dust-free, and ready to transport instantly. The only other thing I can say about the Joy is that it is very, very appropriately named! More information, including videos of the Joy in action, can be found at Ashford and Wingham Wool Work. * The spinning ratio describes how many revolutions of the flyer occur for each single revolution of the drive wheel.